The later part of Addison's life was not without its troubles. In 1716, he married Charlotte, Dowager Countess of Warwick, after working for a time as a tutor for her son. His political career continued, and he served as Secretary of State for the Southern Department from 1717 to 1718. His political newspaper, The Freeholder, was much criticized, and Alexander Pope, in An Epistle to Dr Arbuthnot, made him an object of derision, naming him "Atticus", and comparing him to an adder, "willing to wound, and yet afraid to strike." His wife was arrogant and imperious; his stepson, Edward Rich, was an unfriendly rake. Addison's shyness in public limited his effectiveness as a member of Parliament. He eventually fell out with Steele over the Peerage Bill of 1719. 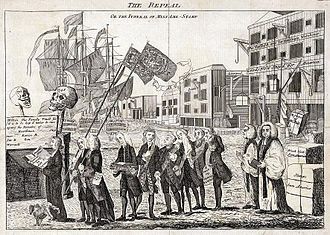 In 1718, Addison was forced to resign as Secretary of State because of his poor health, but he remained an MP until his death at Holland House, London, on 17 June 1719 (age 48). Addison was buried in Westminster Abbey. After his death, an apocryphal story circulated that Addison, on his deathbed, had sent for his wastrel stepson to witness how a Christian man meets death. It is as an essayist that Addison is remembered today. Addison began writing essays quite casually. In April 1709, his childhood friend Richard Steele started The Tatler. Addison contributed 42 essays to the Tatler while Steele wrote 188. Regarding Addison's help, Steele remarked, "when I had once called him in, I could not subsist without dependence on him". On 2 January 1711, The Tatler was discontinued. On 1 March 1711, The Spectator was published, and it continued until 6 December 1712. The Spectator was issued daily and achieved great popularity. It exercised an influence over the reading public of the time. Addison soon became the leading partner in The Spectator. 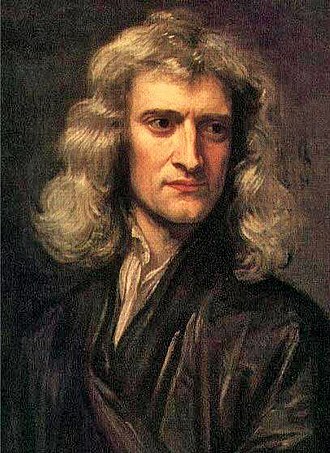 He contributed 274 essays out a total of 555; Steele wrote 236. 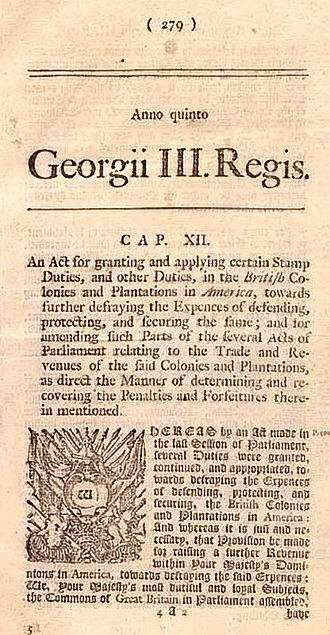 Addison also assisted Steele with the Guardian, which began in 1713. ^ Bellamy, Liz (2007). "It-Narrators and Circulation: Defining a Subgenre". In Blackwell, Mark. The Secret Life of Things: Animals, Objects, and It-narratives in Eighteenth-century England. Cranbury, NJ: Rosemont. 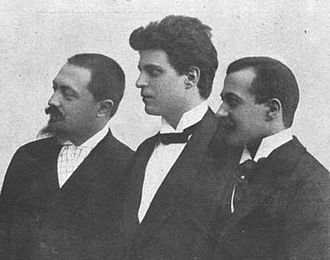 p. 119. Sidney Godolphin, 1st Earl of Godolphin, KG, PC was a leading British politician of the late 17th and early 18th centuries. He was a Privy Councillor and Secretary of State for the Northern Department before attaining real power as First Lord of the Treasury and he was instrumental in negotiating and passing the Acts of Union 1707 with Scotland, which created the Kingdom of Great Britain. He had many roles, including that of Governor of Scilly. He came from an ancient Cornish family, being the son of Sir Francis Godolphin, although he very seldom addressed the House, when he did so, only in the briefest manner, he gradually acquired a reputation as its chief if not its only financial authority. In 1669 he was awarded a 31-year lease on all tin mines in Rialton, in 1670 Godolphin was appointed Groom of the Bedchamber along with a pension of £500 per annum, holding the post until 1678. Charles appointed Godolphin envoy-extraordinary to Louis XIV in 1672 in order to reassure the French King of Charless allegiance before Louis attacked the Dutch, Godolphin was with Louis in the field during the Franco-Dutch War but was unimpressed with Louiss capabilities as a military commander. In March 1679 he was appointed a member of the Privy Council, and in the September following he was promoted, along with Viscount Hyde and the Earl of Sunderland, to the chief management of affairs. After the accession of James II he was chamberlain to the queen, Mary of Modena. In 1687 he was named commissioner of the treasury, Godolphin was involved in the payment of approximately £125,000 by Louis XIV to James II of money in return for Jamess support for Louis, despite Parliament voting James £6,000,000. On the accession of William, though he obtained the third seat at the treasury board. He retired in March 1690, was recalled in the following November, Godolphin was not only a Tory by inheritance, but was thought to have a romantic admiration for the wife of James II. Though not technically a favourite with Queen Anne, he was, after her accession, appointed to his old office, in 1704 he was made a Knight of the Garter, and in December 1706 he was created Viscount Rialton and Earl of Godolphin. An essay is, generally, a piece of writing that gives the authors own argument — but the definition is vague, overlapping with those of an article, a pamphlet, and a short story. Essays have traditionally been sub-classified as formal and informal, Essays are commonly used as literary criticism, political manifestos, learned arguments, observations of daily life and reflections of the author. 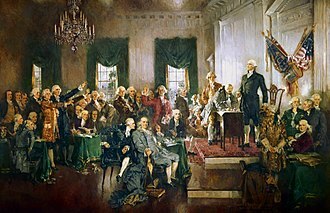 Almost all modern essays are written in prose, but works in verse have been dubbed essays, while brevity usually defines an essay, voluminous works like John Lockes An Essay Concerning Human Understanding and Thomas Malthuss An Essay on the Principle of Population are counterexamples. In some countries, essays have become a part of formal education. The concept of an essay has been extended to other mediums beyond writing, a film essay is a movie that often incorporates documentary filmmaking styles, and focuses more on the evolution of a theme or idea. A photographic essay covers a topic with a series of photographs that may have accompanying text or captions. An essay has been defined in a variety of ways, one definition is a prose composition with a focused subject of discussion or a long, systematic discourse. It is difficult to define the genre into which essays fall, aldous Huxley, a leading essayist, gives guidance on the subject. He notes that the essay is a device for saying almost everything about almost anything, and adds that by tradition, almost by definition. Furthermore, Huxley argues that essays belong to a species whose extreme variability can be studied most effectively within a three-poled frame of reference. Their art consists of setting forth, passing judgment upon, the abstract-universal, In this pole we find those essayists who do their work in the world of high abstractions, who are never personal and who seldom mention the particular facts of experience. Huxley adds that the most satisfying essays. make the best not of one, the word essay derives from the French infinitive essayer, to try or to attempt. 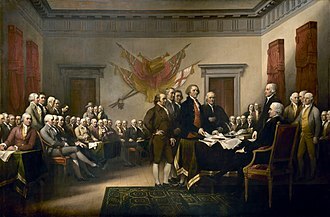 In English essay first meant a trial or an attempt, for the rest of his life, he continued revising previously published essays and composing new ones. Jacob Tonson, sometimes referred to as Jacob Tonson the elder was an eighteenth-century English bookseller and publisher. He was the founder of the famous Kit-Cat Club and his nephew, Jacob Tonson the younger was his business partner. The business was continued by the younger Tonsons son Jacob Tonson, scholars have not always been sure of Tonsons birthdate, and it has in the past been listed as occurring in 1655 or 1656. But the register of christenings in the parish of St Andrew Holborn demonstrates that Tonson was born on 12 November 1655, Tonson was the second son of Jacob Tonson and citizen of London, who died in 1668. 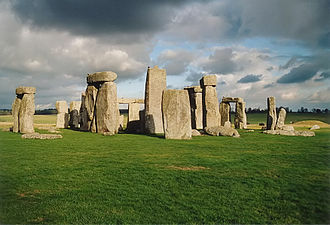 He is believed to have related to Major Richard Tonson, who obtained a grant of land in county Cork from Charles II. His fathers will left him and his elder brother Richard, as well as three sisters, each £100, to be paid when they came of age, on 5 June 1670 Jacob was apprenticed to Thomas Basset, a stationer, for eight years. Richard Tonson had a shop within Grays Inn Gate, Jacob Tonsons shop was for years at the Judges Head in Chancery Lane. 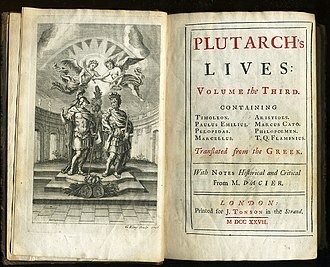 The names of both appear on the title-page, as was often the case at that time. Tonson was sufficiently well off to purchase plays by Otway and Nahum Tate, the other half was purchased at an advance in 1690. Tonson afterwards said he had more by Paradise Lost than by any other poem. In the earlier part of his life Tonson was much associated with Dryden, a step which did much to establish his position was the publication in 1684 of a volume of Miscellany Poems, under Drydens editorship. Other volumes followed in 1685,1693,1694,1703, and 1708, and the collection, which was several times reprinted, is known as both as Drydens Miscellany and Tonsons Miscellany. During the ensuing year Tonson continued to bring out pieces by Dryden, Drydens translation of Virgil, executed between 1693 and 1696, was published by Tonson in July 1697 by subscription. Tonson would pay nothing for notes, Dryden retorted, The notes and prefaces shall be short and he added that all the trade were sharpers, Tonson not more than others. The Battle of Blenheim, fought on 13 August 1704, was a major battle of the War of the Spanish Succession. 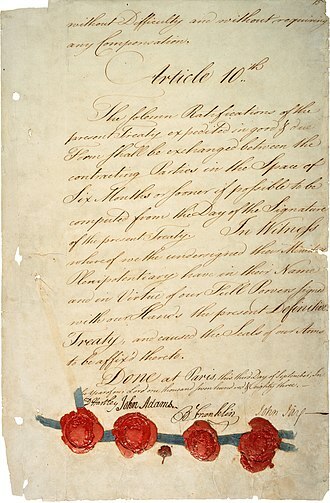 The overwhelming Allied victory ensured the safety of Vienna from the Franco-Bavarian army, Louis XIV of France sought to knock Emperor Leopold out of the war by seizing Vienna, the Habsburg capital, and gain a favourable peace settlement. Vienna was pressure from Rákóczis Hungarian revolt from its eastern approaches. Realising the danger, the Duke of Marlborough resolved to alleviate the peril to Vienna by marching his forces south from Bedburg, after securing Donauwörth on the Danube, Marlborough sought to engage the Electors and Marsins army before Marshal Tallard could bring reinforcements through the Black Forest. However, with the Franco-Bavarian commanders reluctant to fight until their numbers were deemed sufficient, the battle has gone down in history as one of the turning points of the War of the Spanish Succession. Bavaria was knocked out of the war, and Louis hopes for a victory came to an end. 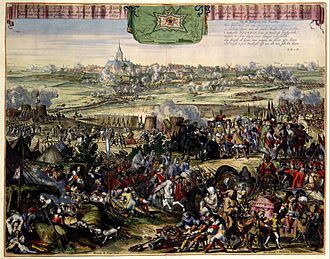 France suffered over 30,000 casualties including the commander-in-chief, Marshal Tallard, before the 1704 campaign ended, the Allies had taken Landau, and the towns of Trier and Trarbach on the Moselle in preparation for the following years campaign into France itself. By 1704, the War of the Spanish Succession was in its fourth year, Vienna had been saved by dissension between the two commanders, leading to the brilliant Villars being replaced by the less dynamic Marshal Marsin. In the courts of Versailles and Madrid, Viennas fall was confidently anticipated, a scarlet caterpillar, upon which all eyes were at once fixed, began to crawl steadfastly day by day across the map of Europe, dragging the whole war with it. Marlboroughs march started on 19 May from Bedburg,20 miles north-west of Cologne, the army consisted of 66 squadrons,31 battalions and 38 guns and mortars totalling 21,000 men. This force was to be augmented en route such that by the time Marlborough reached the Danube, whilst Marlborough led his army, General Overkirk would maintain a defensive position in the Dutch Republic in case Villeroi mounted an attack. The Queens College is a constituent college of the University of Oxford, England. The college was founded in 1341 by Robert de Eglesfield in honour of Queen Philippa of Hainault, the college is distinguished by its predominantly neoclassical architecture, which includes buildings designed by Sir Christopher Wren and Nicholas Hawksmoor. In 2014, the college had an endowment of £206.1 million, the college was founded during the 14th century by Robert de Eglesfield, chaplain to Queen Philippa of Hainault, hence its name. The colleges coat of arms is that of the founder, it slightly from his familys coat of arms. The current coat of arms was adopted by dEglesfield because he was unable to use his familys arms, the frontage of the college was designed by Nicholas Hawksmoor, part of a substantial rebuilding in the 18th century during which the library was built. The medieval foundations, remain beneath the current 18th-century structure, in 2012, the college had net assets of £201.4 million. The college has had an association with the north of England, in part because of its founder. This connection was reinforced for many years until recently by the large number of Hastings Scholarships given to men from 20 schools in Yorkshire. Graduate students from the universities of Bradford, Leeds, the college is named for its first patroness, Queen Philippa of Hainault. Established in January 1341 under the name of the Hall of the Queens scholars of Oxford, an Act of 1585 sought to end this confusion by providing that it should be called by the one name the Queens College, in practice the definite article is usually omitted. The full name of the College, as indicated in its reports, is The Provost. Queens College in Cambridge positions its apostrophe differently and has no article, in April 2012, as part of the celebrations of the Diamond Jubilee of Elizabeth II, a series of commemorative stamps were released featuring A-Z pictures of famous British landmarks. The Queens Colleges front quad was used on the Q stamp, alongside other landmarks such as the Angel of the North on A, the college has one of the best-stocked college libraries in Oxford. 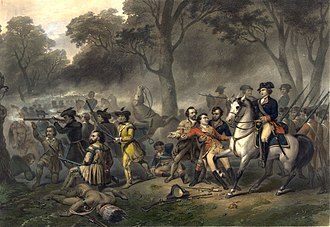 Valley Forge was the military camp 18 miles northwest of Philadelphia where the American Continental Army spent the winter of 1777–78 during the American Revolutionary War. Starvation, disease and exposure killed more than 2,500 American soldiers by the end of February 1778, General George Washington sought quarters for his men with winter almost setting in, and with greatly diminishing prospects for campaigning. 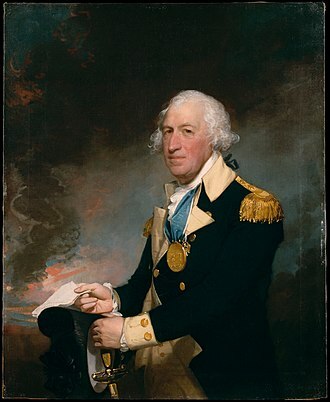 Washington and his troops had fought in early December what was the last major engagement of 1777 at the Battle of White Marsh and he devised to pull his troops from their present encampment in the White Marsh area and move to a more secure location for the coming winter. 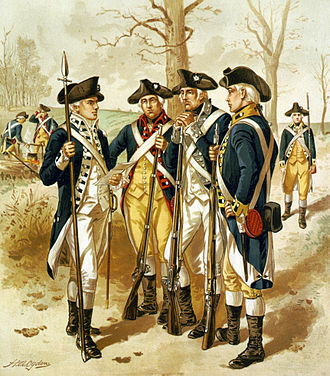 Several locations were considered for the winter quarters, but Washington selected Valley Forge. Valley Forge was named for a forge on Valley Creek in Whitemarsh. It was not the best place to set up camp for the Continental Army. This location left the vulnerable under-supplied army in striking distance of the British, the area was close enough to the British to keep their raiding and foraging parties out of the interior of Pennsylvania, yet far enough away to halt the threat of British surprise attacks. The densely forested plateau of Mount Joy and the adjoining two-mile-long plateau of Mount Misery made the area easily defensible and it provided abundant forests of timber that were used to construct thousands of log huts. Seventy-eight of the huts in the camp housed the soldiers, on December 19,1777, Washingtons poorly fed, ill-equipped army staggered into Valley Forge, weary from long marches. Winds blew as the 12,000 Continentals prepared for winters fury, only about one in four of them had shoes, and many of their feet had left bloody footprints from the marching. Grounds were selected for brigade encampments, and defense lines were planned, the first properly constructed hut appeared in three days. One hut required 80 logs, and timber had to be collected from miles away and it went up in one week with the use of only one axe. These huts provided sufficient protection from the cold and wet conditions of a typical Pennsylvania winter. By the beginning of February, construction was completed on 2,000 huts and they provided shelter, but did little to offset the critical shortages that continually plagued the army. Sir Richard Steele was an Irish writer and politician, remembered as co-founder, with his friend Joseph Addison, of the magazine The Tatler. 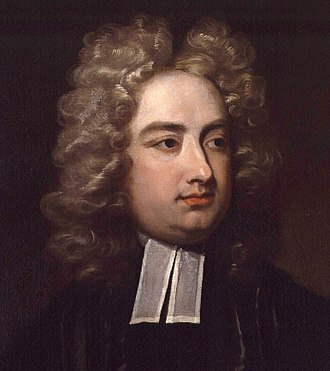 Steele was born in Dublin, Ireland in March 1672 to Richard Steele, an attorney, Steele was largely raised by his uncle and aunt, Henry Gascoigne and Lady Katherine Mildmay. 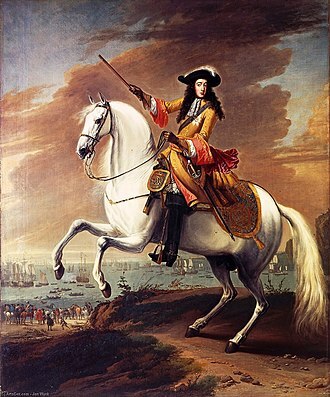 A member of the Protestant gentry, he was educated at Charterhouse School, after starting at Christ Church in Oxford, he went on to Merton College, joined the Life Guards of the Household Cavalry in order to support King Williams wars against France. He was commissioned in 1697, and rose to the rank of captain two years. Steele left the army in 1705, perhaps due to the death of the 34th Foots commanding officer, Lord Lucas, in 1706 Steele was appointed to a position in the household of Prince George of Denmark, consort of Anne, Queen of Great Britain. 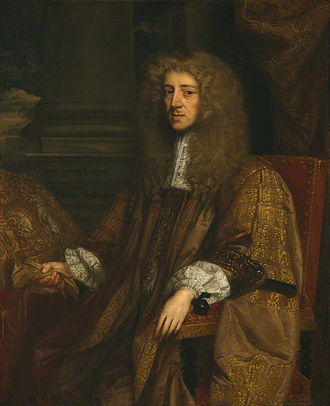 He gained the favour of Robert Harley, Earl of Oxford, Steele became a Whig Member of Parliament in 1713, for Stockbridge. He was soon expelled for issuing a pamphlet in favour of the Hanoverian succession, when George I of Great Britain came to the throne in the following year, Steele was knighted and given responsibility for the Theatre Royal, Drury Lane, London. 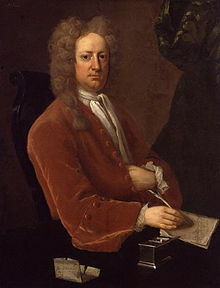 He returned to parliament in 1715, for Boroughbridge, while at Drury Lane, Steele wrote and directed the sentimental comedy The Conscious Lovers, which was an immediate hit. 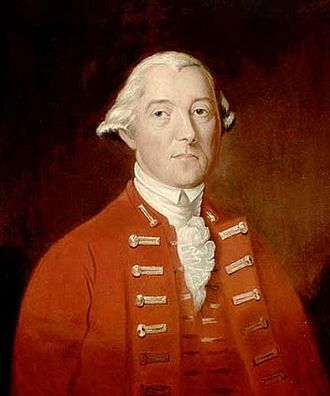 However, he fell out with Addison and with the administration over the Peerage Bill, and in 1724 he retired to his wifes homeland of Wales, Steele was a member of the Kit-Kat Club. Both Steele and Addison became closely associated with Childs Coffee-house in St Pauls Churchyard, Steele remained in Carmarthen after his wife Marys death, and was buried there, at St Peters Church. During restoration of the church in 2000, his skull was discovered in a lead casket, Steeles first published work, The Christian Hero, attempted to point out the differences between perceived and actual masculinity. Written while Steele served in the army, it expressed his idea of a pamphlet of moral instruction, the Christian Hero was ultimately ridiculed for what some thought was hypocrisy because Steele did not necessarily follow his own preaching. Of the 271 essays published in The Tatler, Joseph Addison (left) wrote 42, Richard Steele (right) wrote roughly 188, and the rest were collaborations between the two writers. The basic anatomy of a millstone. Note that this is a runner stone; a bedstone would not have the "Spanish Cross" into which the supporting millrind fits. Jacob Tonson took into partnership his nephew (pictured), also named Jacob Tonson and sometimes referred to as Tonson Junior. John Philip Kemble and Sarah Siddons, in "Macbeth", painted by Thomas Beach in 1786, now housed at the Garrick Club in London. Cartoon of the riots by Isaac Robert Cruikshank, entitled Killing No Murder as Performing at the Grand National Theatre. Statue of Cato the Younger in the Louvre Museum. He is about to kill himself while reading the Phaedo, a dialogue of Plato which describes the death of Socrates. The statue was begun by Jean-Baptiste Roman (Paris, 1792–1835) using white Carrara marble. It was finished by François Rude (Dijon, 1784 – Paris, 1855). Propaganda cup of Cato (the cup to the left, the one to the right being dedicated to Catilina), for his election campaign for Tribune of the Plebs of 62 BC (left cup). These cups, filled with food or drinks, were distributed in the streets to the people, and bore an inscription supporting the candidate to the election. 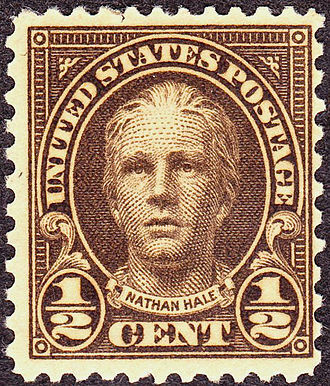 Nathan Hale appeared on US postage stamps issued in 1925 and 1929. 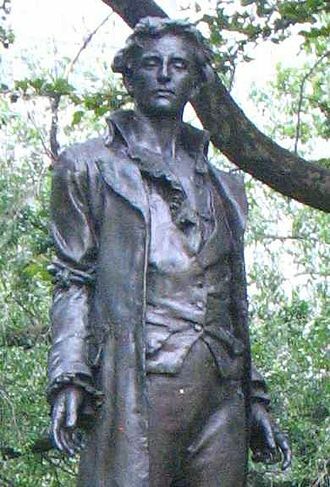 The likeness is from a statue by Bela Lyon Pratt.